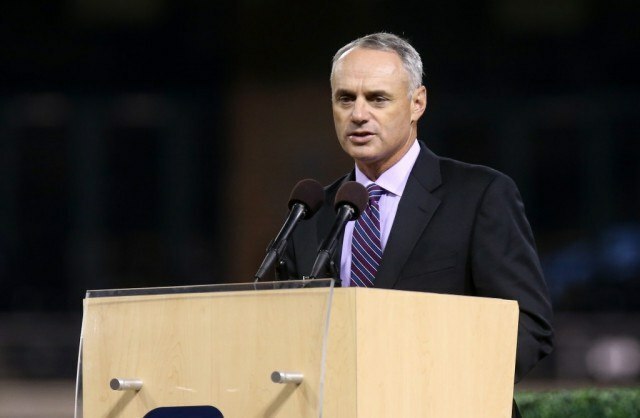 Earlier this year Major League Baseball commissioner for Rob Manfred told ESPN‘s Darrell Rovell that he would discuss the idea of shortening the regular season if there was enough interest for it. Given the length of the MLB regular season, this is certainly an interesting topic of debate. With a new commissioner who is clearly focused on tightening up the sport of baseball, you have to wonder if this change would be a step in the right direction. Unlike the potential elimination of defensive shifts, would this be the move that actually saves Major League Baseball? There should be no contention that the current 162-game regular season is brutal. It’s a lot of games, a lot of travel, and a lot of wear and tear on the players’ bodies. For the average fan, it can be just “too much” in general. We can only imagine both the mental and physical strain it must put on the players and coaches who have to endure it. And yet this topic is not a pressing matter for the new commissioner. 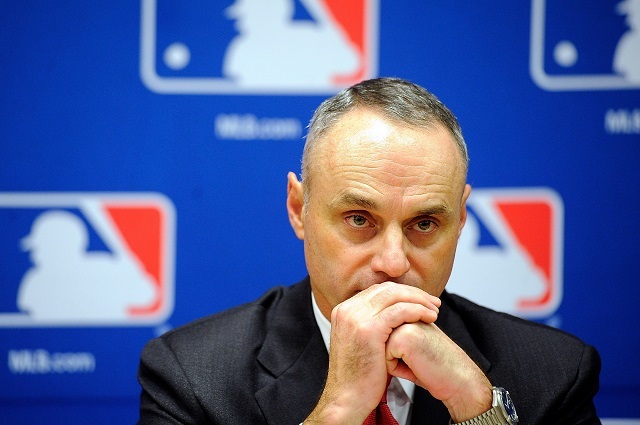 Manfred is less concerned with the duration of the entire season, as he is with the length of the individual game itself. 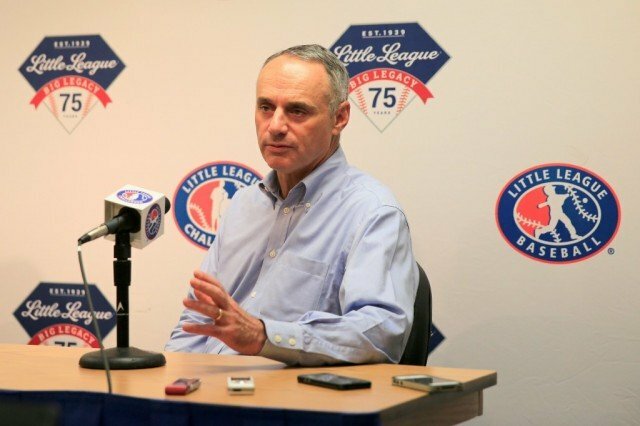 By implementing new pace-of-play initiatives, the priority is clearly focused on reducing the average length of the ballgame, which has now clocked in at 3 hours, 2 minutes in 2014. It makes perfect sense to do what is needed to make sure a game runs faster. The slower pace is often considered one of the major turnoffs of the sport as a whole. However, we believe this is merely a microcosm of a much larger issue. And it’s the one that’s currently taking a backseat at the moment. We don’t have the patience for a season that lasts 162 games. Sure, it gives ample opportunity for teams to make a run at the playoffs, but it also means that players are more likely to need a rest. ESPN noted, per research by Stats LLC and published in the Wall Street Journal, that last season, less than 9% of position players in baseball played in at least 150 games. That total was the lowest percentage in the history of major league baseball. It goes to show that shortening the season could be exactly what everyone needs. Shortening the length of the regular season is not something that can just happen overnight. Due to the fact that it affects working conditions and service days, this change would have to go through collective bargaining. But we believe that it would be worth it. There is something incredibly exciting about the Major League Baseball postseason, and it’d be nice to get there sooner. In fact, a shortened season might do wonders for creating more competition. If there were less games in the regular season, than it would force teams to play with a sense of urgency. Every game would be that much more important. And we believe that would bolster excitement within the sport. But more importantly, shortening the season would be in the best interest of the players. A 162-game schedule has to be a grueling affair, and we certainly couldn’t imagine going through it. If most of the changes occurring in the sport of baseball are intended to speed up the game, then this would clearly have that effect. Let’s continue to pick up the pace — it’s how we’re going to save the sport of baseball.